Given the time, effort, and resources that go into TNR, one has to wonder whether it is worth it. The answer is an unequivocal yes: Study after study shows that TNR is humane and effective at managing colonies, unlike the outdated trap-kill technique. TNR provides benefits at three levels: the feral cats’ lives are better, the neighbors’ are calmer, and the size of the colonies decreases over time. Cats who are spayed and neutered and live in managed colonies are healthier and live longer. They fight less and roam less. Those changes improve the relationships between the cats and their human neighbors. Less yowling and fighting leads to fewer complaints! Perhaps most importantly, aggressive TNR can help reduce the number of cats entering local animal shelters and the resultant euthanasia. For example, one shelter in Albuquerque, New Mexico, reports that after spaying and neutering 6,500 cats in 3 years in a partnership with TNR providers in the area, the shelter took in 19% fewer cats in the succeeding six months. And the people involved — those in the community and those working for animal shelters/control — experience improved morale as the killing rate goes down. Despite ample evidence to the contrary, the myth that cats, especially outdoor cats, are vectors for all kinds of diseases persists. Research results demonstrate that the fears are not justified. Perhaps one of the more compelling arguments debunking the myth is to point out that cat colony caregivers are not suffering from health problems caused by cats. (Think about it, feral cats will do almost anything to avoid human contact so they will not sneeze in your face or pass on germs while shaking your hand like your best friend or co-worker might.) And, good TNR programs include vaccinations to prevent the cats from getting sick in the first place. Finally, most cat diseases are simply not communicable to human beings. Another myth that lives on and can cause tempers to flare is that outdoor cats (including all the Fluffys and Garfields who are allowed access to the outdoors) are killing off our songbird population. Again, research shows otherwise. In fact, we need to take a long look at our own species’ affect on bird populations. Habitat destruction and fragmentation, pollution, and erecting buildings and other structures (wind energy turbines) in the path of birds cause a significant amount of death and injury. 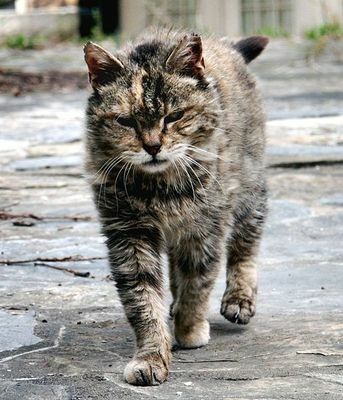 Feral cats who live in a managed feral cat colonies often live healthier and longer lives than their unmanaged counterparts. However, many humans in our community do not understand the issues surrounding feral cats or the viability and large- and small-scale positive impacts of TNR programs. The more that people learn about and support TNR, the more cats’ lives can be saved.